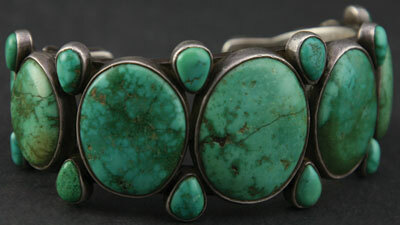 The use of turquoise has been around the southwest since prehistoric times. The Anasazi used turquoise and shell to make beaded necklaces, bracelets, earrings as well as decorate effigies. Using turquoise in southwestern jewelry is still popular today, not only by people that live in the southwest, but by people world wide. The use of turquoise in jewelry is a thousand year tradition. 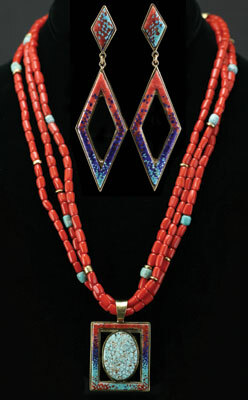 I remember growing up in New Mexico in the early 1970s and being part of the great southwestern Indian jewelry bonanza. Any dealer from this time remembers the ‘70s with fond memories. One could not find enough material to fill demand. Gilbert Ortega, one of the kings of Native American Jewelry, opened shops as fast as possible using a plane to fly from city to city in Arizona, New Mexico, and Texas to fill orders. Like all good things the bottom fell out by the mid ‘70s and Native American jewelry sales and demand returned to normal. I still see on a weekly basis clients who bring in items from the late ‘60s and early ‘70s. Many of these pieces have the same kind of look and feel. Unfortunately for those who purchased their “squash blossom necklace” during the period of free love in America, they were heavy, ornate, expensive and the price they paid then is not much more than the price in today’s market. From an investment point of view, one should have been buying great old pieces made between 1870 and 1940. There are a few exceptions but generally these pieces have continually increased in value, and in today’s market can easily demand in the tens of thousands of dollars. 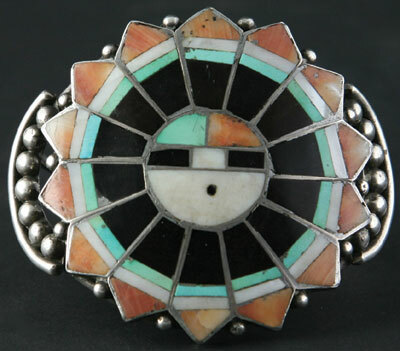 Artists like Charles Loloma of Hopi, who was considered expensive during the 1960s and ‘70s, was a genius in regards to jewelry design and use of material. Loloma’s great work can now bring six figures. It’s not unusual for a great inlay Loloma gold bracelet to sell for $30,000 to $50,000. Today one needs only to go as far as the internet to see how many businesses sell southwestern and Native American jewelry. This is the tricky part. How does one go about determining what is real, fake, over priced, or even native made? Websites that give lots of information including vintage dates, origin of maker, prices, dimensions, and multiple images are usually the best. If the site has a “brick and mortar” location or multiple store locations this is generally a good sign, especially if they have been in business for awhile. Businesses that just are internet based need to be thoroughly checked out. Ask for authenticity certificates and return policies. When you are shopping for Native American Jewelry, if the piece is described as “Indian Style,” that is generally code for not Native American Indian made. QVC and HSN for example have lots of “Southwestern Style Jewelry” for sale. Make sure if you are paying for Native American Indian Jewelry, that is truly native made. Look for individuals selling jewelry that belong to organizations with high standards for authenticity. If you are looking for older Native American jewelry, membership in the Antique Tribal Art Dealer Association, ATADA, is good sign. There are lots of “old style” indian jewelry pieces in the market place. Its fine to buy this type of jewelry and often it is wonderfully made and native, but make sure you are not paying authentic vintage Native American prices. “Pawn” jewelry is a term used within the Native American dealer community and refers to old Indian jewelry that was traded for credit or goods. 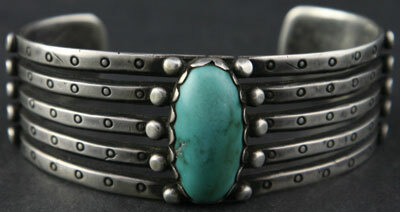 Old pawn jewelry was often Navajo made. You can still get pieces that really are “old pawn,” meaning they still have the original pawn ticket attached. The ticket may be dated as late as the 1980s but the jewelry could actually be an early vintage piece. Many old time trading post dealers knew the jewelry’s owner and gave them ample time to recover their piece before it was sold. Pieces could have been pawned multiple times over decades. If you do get a piece with a pawn ticket it does add value to the piece. The amount can vary depending on how old the jewelry is and the pawn history, but paying a 10 to 20 percent premium would not be out of line. Here is a rough guide of what you could expect to pay for antique Native American Indian jewelry: Jewelry in general that is circa 1900 or before will be the most expensive. These pieces are often very simple and easily faked, so always buy from a good source. Bracelets and squash blossoms can easily run $3,000 to $7,500 dollars. A first phase Navajo belt from this time frame could be $25,000. Bracelets and Squashes with nice turquoise from the 1900 to ‘40s will generally be $1,000 to $3,500, but you can still find nice examples for $500 to $750. Old rings which are primarily Navajo and Zuni have become very collectable, there are still bargains to be found if you are patient enough to look through lots of rings. A great early ring may bring up to $750, but generally you can find a nice 1920s or ‘30s ring for under $100. Jewelry from the 1960s and ‘70s is still very findable and generally bracelets range anywhere from $100 to $350 and squashes $350 to $1200. This type of jewelry is generally what you will find on Ebay listed as old pawn. 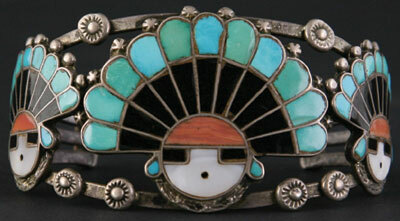 Seeing as much Native American jewelry as possible in person is a great way to get to know the material. A loop that can magnify the piece to see appropriate wear patterns is a great tool to carry. “Wear patterns” should be just that, if you wear a piece it will develop smoother areas from repeated use, just like the soles of your shoes do. For example, the ends of a bracelet where you hold it to take it on and off, and the end beads on a squash where they rub should show wear. If wear is nonexistent or file marks can be seen in areas that should have worn, red flags should go up. Of course not all old jewelry gets the same usage depending on the owner, so just because a piece doesn’t have typical wear doesn’t mean it couldn’t still be old. This is where experience and first hand knowledge of the owner and piece are critical. Generally, I have found dealers that always know unequivocally what type of turquoise is in each piece are the least knowledgeable. The fact is turquoise colors and types can be extremely varied from mine to mine. The best dealers rarely say this has to be from a specific mine but will give you a couple of possibilities. 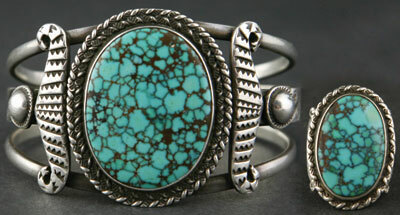 The most important issue with turquoise is that is natural and not treated with a resin. The natural pieces generally are harder, have a matrix and are not robin’s egg blue in color. Again buying from reputable dealers who guarantee authenticity is a must. Santa Fe New Mexico probably has the most stores carrying Native American jewelry in one location. If you want to buy new Native American jewelry, shop under the Portal of the Palace of the Governor’s where an artisan’s ethnicity is vetted. Also Santa Fe Indian Market is a great way to meet artists and get an outstanding authenticated piece. The event is the third week in August and is the largest Indian art show of its type. Hundreds of thousands of people will attend the two day event. This market is vetted so you know everything you purchase is Native American made. Because of the large number of buyers don’t expect any bargains, but you can expect some exceptional pieces as many of the artists bring their very best to this show. The great jewelers set their prices and will sell out within the first day. Late afternoon of the final day of Indian Market might be a good time to do a little haggling as the artists may not have sold what they hoped and it is appropriate to see if they have any wiggle room. Remember this is their livelihood so insulting offers while occasionally effective, won’t result in any long term continued relationship. When in Santa Fe ask the hotel concierges or check out books like Canyon Road Arts for galleries that sell vintage Indian jewelry. It’s amazing how the same dealers come up again and again as the people to buy from. These individuals try to market their pieces fairly so room for negotiation is usually very little. A good way to judge if you are in the right store is to ask if they will discount something. If they tell you they are having a sale and will take off 30 to 50 percent, walk out. These stores are only looking to make as much as they can on one sale and have no interest in authenticity or long term relationships with their clients. They are strictly looking for the unknowing tourist and you can bet their jewelry is “old style” at best. Most of the best shops for vintage material are on Canyon Road or in out of the way places, not the heavily touristed areas, though there are a few exceptions on the plaza. If you do visit Santa Fe, make sure you visit the art museums. The Wheelwright and the Museum of Indian Arts and Culture almost always have a display of vintage Indian jewelry. The Heard Museum located in downtown Phoenix has a permanent exhibit of both vintage and contemporary Native American jewelry. In Tucson, the Arizona State Museum located on the Campus of the University of Arizona is currently featuring Set in Stone: 2000 Years of Gem and Mineral Trade in the Southwest until 2010. A little known but gem of a museum, Museum of the West, is located on the east side of Tucson next to Medicine Man Gallery. It always has nice examples of early Indian jewelry on display. There is a lot to know about collecting antique Indian jewelry so it’s a good idea to focus on a single area and learn it well, like bracelets, then move onto another category. You will find the information you glean from seriously collecting a single category will apply itself well when you start to learn about a new area, though each specific category will have its own unique challenges. The best thing about collecting Native American jewelry is you get to wear what you collect! How great is it to have your collection with you at all times, you own personal museum…wow where did you get that? This article was excerpted from Canyon Road Arts: The Complete Visitors Guide to Arts, Dining and Santa Fe Lifestyle, Vol 4, 2008-2009, pages 48-53. Canyon Road Arts is published by Medicine Man Gallery. All rights reserved.